Models: MK-PWA-500 - Medi-Wrap Arm/Leg Immobilizer - 15" MK-PWA-600 - Medi-Wrap Arm/Leg Immobilizer - 17" MK-PWA-700 - Medi-Wrap Arm/Leg Immobilizer - 19" MK-PWL-500 - Medi-Wrap Plus Arm/Leg Immobilizer - 15" MK-PWL-600 - Medi-Wrap Plus Arm/Leg Immobilizer - 17" MK-PWL-700 - Medi-Wrap Plus Arm/Leg Immobilizer - 19"
By popular demand immobilizers are now offered in adult sizes, also, referred to as adult splints or an adult restraint system. Sold in Pairs. Please specify for Male or Female when ordering. For Pediatric Arm Immobilizers, see Pedi-Wrap Arm Immobilizers. 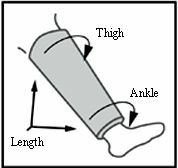 For Pediatric Leg Immobilizers, see Pedi-Wrap Leg Immobilizers. • Holding the arm straight out, measure the arm from the underarm to the palm. This is the length you need. 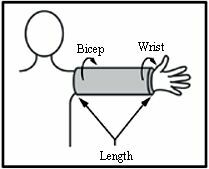 • Measure the circumference of the bicep and the wrist. The Pedi-Wrap is intended to cover the full length of the patient's arm. It should not be fitted in the mid-bicep area or it will not provide adequate support or immobilization.